Marc Haendle at Ocean Independence tells me that he and Bill Sanderson at Edmiston & Company have now taken over the joint listing for sale of the 42.85m sailing yacht Hetairos with a substantial price reduction. Built by Abeking & Rasmussen in 1993 to a design by Bruce King with an interior by Andrew Winch, she’s a classic wooden ketch of the highest pedigree, designed and built for world cruises and superyacht racing. Still owned by the sailing enthusiast who commissioned her build, she has been cruising to the four corners of the world, including the Amazon, Alaska, New Zealand, Madagascar, Greenland, Spitsbergen and the South Pacific. The extremely shallow draft of 3.2 m allows great flexibility for cruising, while with the centreboard down the yacht has tremendous sailing performance. 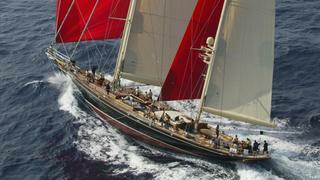 Hetairos is also well known and respected on the regatta courses around the world, where she has won numerous titles, including the Spirit of Tradition Class of the Rolex Maxi Worlds. Accommodation is for 10 guests in a full beam master suite plus two double and two twin cabins. Previously on the market at €13.8 million, Hetairos is now asking €9.9 million.